Here's where you can get a Bosch, which is what I like to use to make homemade bread. Or here are variations to this soaked bread recipe to make hamburger buns, hot dog buns, cinnamon rolls, etc. 4 cups organic whole wheat flour (I sometimes grind the whole grains in my Nutrimill from “hard” wheat, don't use pastry flour or “soft” wheat for bread), or I like using organic whole einkorn flour. 3/4 cup buttermilk (I make it from our raw milk – it's so easy! Read how to make buttermilk) – you could also use whole milk yogurt, or kefir. (Nourishing Traditions says if you have milk allergies to use an equal amount of water + 1 Tablespoon lemon juice, whey or vinegar, but I haven't tried this.) I thought the buttermilk was easiest to make, it keeps a long time, and it is economical. According to Susan, a reader who has been experimenting with me, it also works as a dough enhancer. 1 egg — wonder which eggs should you buy? 1. The night before, add these ingredients to your Bosch Kitchen Mixer or other big mixer or breadmaker: flour (first two listed above), buttermilk, and warm water. 3. The next day, or whenever you're ready to finish your bread, here's what to do next: Add to the Bosch: the egg, 3 cups white unbleached flour. 4. When the dough has cleaned up the sides and middle of the bowl, check how the dough feels and see if you need a bit more water or flour (you'll know if it feels too dry or too wet), and then set the timer for 14 minutes and continue mixing on the lowest speed. 8. Cool. When you take it out of the oven, immediately (carefully) take it out of the pan and cool on a wire rack, otherwise condensation builds up in the pan and makes the bread soggy. Use this soaked bread recipe for your everyday bread – sandwiches, toast, etc. Freeze in a labeled freezer baggie after it's cool. Buy a Bosch mixer here. Note – this recipe is a work in progress! If you notice the recipe changing here each time you check, it's because I'm trying things that may or may not be working. When I just doubled the 3 loaf batch from above, it was too much dough for my Bosch – the top was coming off, and it was dripping out the sides. But I ended up getting 7 batches of bread: 5 loaves, 7 hot dog buns, and a pan of cinnamon rolls out of it – so my 3 loaf batch must be 3 bigger loaves than I made. Add 5 cups white unbleached flour – you MAY need more of this – go by how it feels. Too dry? Add a few drops of water. Too wet? Add a bit more flour. Add to the hot water (so it melts) 1/2 cups refined or unrefined coconut oil. Once it's melted, add it in, and start mixing on the lowest speed. When making all 6 loaves, you'll need to bake 3 at a time, obviously, unless you're lucky enough to have two ovens. Let me know how it goes for you! My 7 year old granddaughter and I finished making your soaked bread recipe today. My 11 year old Kitchenaid died after 2 minutes on low so I finished kneading by hand while she buttered the pans. The bread was lovely. My grandkids pronounced it ” The best bread Ever!” and my carb king hubby loved it too. Now I have the excuse I needed to buy the Bosch I’ve been wanting. I noticed a lot of questions about whether a Kitchenaid can handle this recipe and I do believe that you take a risk with the 3 loaf recipe. The recipe is super easy and delicious! I made your bread for the first time this week. Delicious is the only word I would use to describe it. I have two other loaves in the freezer for when I need it. Thank you for this recipe. I did a calculation in “myfitnesspal” for the calories and each slice is about 143 calories based on 12 slices per loaf. Low cal, delicious, and healthy. I didn’t change your recipe on bit, I didn’t need to as it was perfect! Wow, that’s SO good to hear, thank you for telling me!!! This is a good reminder to make it again. I’ve been out of the habit. I made bread in my Bosch for 40 years.If the dough is sticking to the sides it needs more flour. If you don’t want to use unbleached flour then sift out the bran in unsoaked flour, since most of the phytates are in the bran layer. Needing more than 10 minutes in a Bosch is not necessary. Too long of a knead will produce an impossible-to-fix sticky dough. If the loaves are falling it’s from over-rising. To get the best oven spring always place cool loaves in a preheated oven. If doubling the recipe, do not double the yeast. I never use more than 1.5 T for 3 loaves. Bread making is artistry and every baker has their technique that works for them. I’m gluten-free now so I don’t bake as much as I used to, but I made authentic sourdough bread in my brick oven for years in addition to yeasted loaves in my regular oven. The nice thing about baking bread is that you can generally eat your mistakes. My problem is that even though I added more flour…up to 3 xtra cups, the flour never cleans the sides or balled up. How much flour do you add at a time? And how long do you knead that before adding more flour? My advice would be to give it a couple minutes and you can tell if it’s starting to get the extra flour off the sides. If it’s not even close, sprinkle in about 1/4 cup or so and wait another couple minutes, etc. Also, feel the dough, you can tell if it’s too wet or too dry by touch. Be patient with yourself, too, it takes time to figure this out! When so you add the ice cubes? Does anyone else have trouble getting the Bosch to “clean the sides of the bowl”? Any solutions? I’ve added flour but all I get is sticky, coarse looking dough still clinging to the bowl sides. I’ve let it mix and mix and mix (from 15 minutesup to 30!) and I end up with overly heated dough that’s still sticky and rough looking. Any experienced Bosch users out there……please advise. Just wondering why you use commercial yeast? I’ve actually been out of the habit of making bread *regularly* for the fam, but when I do get back into it more consistently, I’m going to lean more toward sourdough loaves with no yeast! Thanks for the recipe, excited to start on this today! I will use my Kitchen AId though, should be plenty powerful/roomy enough for the 3 loaf recipe. I’m planning to make this soon, but I am concerned about the temperature of my house. Does it matter what the actual room temperature is for the overnight soaking? I just had a batch of homemade buttermilk fail because it was too cold. Will temperature matter in soaking the flour? Thanks. Does anyone have a recipe for white bread in the Bosch Mixer for larger batches (6-8 loaves)? I don’t mill my own flour. I just received my Bosch Mixer and need a basic recipe that doesn’t call for Gluten and all. How sticky is the dough supposed to be? It was fine before the 14min knead, but after it was very, very sticky. Any thoughts? Sometimes you can add more flour or water, depending on what you think it needs, and that saves it. Usually too sticky needs more flour. Of all the times I’ve made it, a couple times the dough was just weird for whatever reason. Old yeast or whatever it may have been. I was just reading some of the other comments above. The general guideline is that if you are making something using baking/powder or a “quick” type of bread/muffin, you should use soft wheat and grind it into flour. If you are making something with yeast, use hard wheat flour – the soft wheat flour doesn’t have enough gluten in it to hold the little air bubbles. Soft wheat flour is more like cake flour, and works great for banana bread, muffins, etc. Hard wheat flour has more gluten in it and in necessary for yeast breads, cinnamon rolls, or any kind of rolls/breads made with yeast. All-purpose flour is a blend of hard and soft wheats, but for bread you need the larger part to be hard wheat. The stretchiness or elasticity of the dough is what you want, the stretchy dough holds the air created by the yeast as it grows in the bread and makes little air pockets which make it light and fluffy. If the dough isn’t stretchy (old wheat perhaps) you won’t have good bread. Also, if you ever leave bread to rise too long and it’s grown too big, just take it out of the pans, knead and re-shape it, wipe out the pans and re-grease them, put the dough back in and let it rise again – but it won’t take as long the next time. Believe me, I’ve done this many times! 🙂 Most of the time my bread takes less than an hour to rise, so it’s good to keep an eye on it every once in awhile. My experience has been that the flat top bread has usually risen too long before baking – it gets heavy and tends to fall out over the sides of the pans as it bakes. I usually put it in the oven when it’s slightly smaller than what I want it to end up like – it usually grows another 1/2 inch or so in the oven. about 12 cups of whole wheat flour, adding 7 cups at first, then adding the other 5 slowly until the dough is the right consistency. Over the years, I’ve tried adding vitamin C or dough enhancers, but personally I didn’t feel it made that much difference. I think the biggest difference is in how old the wheat is that I grind to make the flour. Wheat older than about 5 years doesn’t seem to make as nice a bread as newer wheat. Old wheat requires help from dough enhancers/white flour or adding gluten, but fresh, white wheat does fine all by itself (100% whole wheat flour). I’m talking about hard white wheat which makes much softer, lighter bread than the old red wheat I grew up on. I’ve found that adding eggs/milk to the bread makes it delicious, but it molds faster, even in the refrigerator, so I have to make sure to freeze it. Adding lemon juice to create buttermilk is another type of dough enhancer, I love adding it when I make rolls. Thanks for all your fun food ideas! I cut your recipe in thirds and I’m trying to turn it into a bread maker recipe. I’m very excited! I scaled down the recipe to make one loaf and used plain yogurt It came out delicious but, I too want to know how to avoid using the unbleached white flour does anyone have any suggestions. Could I use a kitchenaid mixer? Would that blend it enough? I’ve never tried it, but I’m pretty sure that would be fine. The biggest difference is that the bowl isn’t as big, though, so just don’t try the really big batches with that one. You can easily bake 6 loaves at once if, instead of loaf pans, two 13 x 9 pans are used. Three loaves fit nicely. The loaves have to go [I I I] like that in the pan. Do you use quick rise or traditional yeast? I used traditional today and bread turned out really heavy…. Hmmm, I use regular (not quick rise) – was everything else the same in the recipe and it came out heavy? Sharon, I would like to know your recipe if you would be willing to share it! Thank you! In our journey to eating more traditionally, I came to the point where I was ready to tackle bread. I’ve been making it in a Bosch, but not soaking it. I wasn’t sure if I could use my existing recipe and if I would need to alter the liquid or flour, so I started searching recipes online. Almost all of them either added white flour or more whole wheat flour to the final stage, which I didn’t want. I came across one in which the author added all the flour for the recipe (including estimating the final stage) to the water/acid medium for soaking, so I decided to try my existing recipe and do that. It came out great. I’ve read all the comments here and wanted to add a comment regarding this. For those who want all the flour to be soaked and don’t want white flour – it can be done. I gleaned a lot from your site. Thanks. I too have a Bosch, but I have not been able to find a good soaking recipe that doesn’t call for more flour later. Would you be willing to send me your recipe too? [email protected] Thanks! Sharon, this comment is YEARS old…. hahaha but are still having good luck with the recipe you have for 100% WW soaked bread? I got my grain mill and Bosch from “Pleasant Hill Grains” and they sent along a recipe for 2, 4, 6 and 8 loaf batches of bread. I tried adapting it to soak and just couldn’t get it to come out – bricks galore. I just wanted to tell you again how much I love this recipe. I’ve had one air bubble incident, and I’ll have to try the thud/splat method to avoid that again. But my question is about freezing. I froze the dough (for about one week) and let it defrost overnight in the fridge…then I let it rise in the oven for the 2-3 hours, and it never rose! I baked it anyways. Definitely a fail. So the questions are: how do you defrost the dough? any ideas for fails? I just baked my first 3 loaves & they are tasty! I had some trouble with air bubbles (I should have read the comments first!! 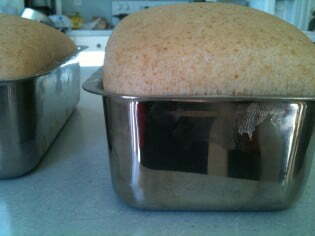 ), and it ended up taking 30 minutes to bake through with my huge, glass bread pans. Thank goodness I tested the first loaf before taking the other two out! That you for your wonderful recipe. I have been using your recipe for awhile and my family just loves it. I have a couple of questions: 1) What type of yeast do you use. I have been using the SAF Instant Yeast and it only takes the dough about 1 hour to rise (or double in size). 2) My dough is a bit sticky (I butter my hands when working with it so it works) do you have any ideas on why it may be sticky? The bread always turns out and the consistency is always good. Thanks again for sharing your recipe and for your wonderful blog. I just made the 6 loaf recipe as above by hand. Took a good 30-40 min to knead it to window pane, but I don’t mind. Only variation I made was substituting 1/4 cup of the honey for blackstrap molasses, just for the nice color and flavor of it. The problem came when rising. I was going by the 2-3 hour recommendation and before 2 hours the three loaves I had rising had collapsed! So depressing. Good thing I froze the other three loaves and can try again. I can’t help but think 2-3 hours would be a reallllllly long time to rise unless your kitchen is freezing cold? By the time it’s getting large bubbles in it, its over risen. Live and learn! Wow, are you sure you used the right amount of yeast? If so, I’d decrease that next time if I were you. I just saw your other comment, sorry! My t. is teaspoon, and T. is tablespoon. So sorry for your collapse, I hate that!!! Kelly, do your T’s in the recipes mean teaspoon or tablespoon? I am only used to tsp. or Tbsp. Thanks! can this be used in a bread machine? I have no clue how to scale down. My demensions mixer (similar to bosch) died and I have no big mixer. *sigh*. I miss bread and I am tried of paying near $6 a loaf. But most of the soaked bread recipes have been awful to be honest. IS this sour? I have soft white wheat grains which is supposedly best for none yeast breads. Could I grind that and use it in place of your Bob’s red mill unbleached flour? Is the Bob’s flour basically just an organic version of the standard store bought unbleached all-purpose flour? I’m also just trying to get a handle on whether I can 1) use what I have and 2) make it all whole grain. And/or could I just add in regular fresh ground flour the next day and have a half soaked recipe? I wouldn’t use soft flour for yeast breads, I don’t think you’d get good results and it’s not comparable to Bob’s Red Mill unbleached white. Bob’s IS an organic version of the regular white unbleached at the store, though. If you want 100% whole grain, it won’t end up as soft or rise as well in my experience. For that to be successful, most people use some sort of dough conditioners or some vital wheat gluten, and I just haven’t had time to experiment much with that, but hope to *someday*. There are definitely some great 100% ww recipes out there, I just haven’t found THE right one for us yet. If you try it, instead of adding more the next day for a half-soaked recipe, just adapt and add all the ww flour in the night before and more of the liquids, too, so it’s warm and moist for overnight. Kelly I SO want to try this recipe but I do not have a BOSCH or and king of mixer……how would you hand make this dough? I actually LOVE making bread by hand so it wouldn’t bother me to rise and knead several times. Also you mentioned above about ascorbic acid? How would you use that in this recipe!? Thanks, I’ve been making my own WW bread a=for awhile but it is definitely lacking int he softness department. Anxious to try something else. I can’t remember for sure about the ascorbic acid, but I think I added a half t. per batch. I didn’t notice any difference, though. Veronica, I wonder if you just needed to add a little water? Or maybe try an even smaller batch in your KA? I was SO excited to find a soaked grain bread recipe that could be made using my Kitchen Aid! I started my batch using the 3 loaf recipe last night, (one loaf of bread and 24 dinner rolls). I love the way the dough smelled when I got up this morning! I read other comments from readers who were able to use this recipe with their KA mixer. That part didn’t work out so well for me for some reason. The dough just balled up really tightly around my dough hook and the motor in the mixer sounded like it was working extra hard. I ended up kneading mostly by hand, after several frustrating mintues of trying to make it work in my mixer. The dough felt wonderful as I was shaping the loaves and the rolls. I have them rising right now. I was wondering if any other KA users would be willing to share some tips as to how they were able to make this work in the mixer. It could be that mine just isn’t powerful enough, I guess. Either way, thank you so much for this recipe! The dough looks and smells great. I can’t wait to try it when it’s done. Another note for anyone concerned about using coconut oil because of taste: I used half unrefined coconut oil and half butter and it seems to have worked great. I prefer coconut oil, but I only use unrefined and didn’t want to taste it in the finished bread. Keep in mind I haven’t played around more with the 6-loaf recipe, I still usually make 3 at a time. You could try omitting the eggs and then just see how the dough feels when deciding if it needs more water and how much. It should feel soft but not sticky. (Usually 1 egg = 1/4 c. or so.) And yes, your King Arthur flour should be just fine. Good luck! I am very excited to try the soaked bread recipe. I tried a soaked bread recipe a while ago and my family didn’t like it but, I think it was because it called for vinegar. This time I am trying raw kefir. I hope they like it better. I am making the 6 loaves recipe and was wondering if I should omit the 2 eggs or not and also how much water to add if I do. I wasn’t sure if I should omit the eggs and add the water indicated (1 cup). Also, I do have King Arthur unbleached white flour. Would that work instead of Bob’s? My flour has soaked all night but, it will have to soak longer because I realized I need more yeast and need to run and get some. It sounds like it will still be good if I let it sit longer. Well, thank you in advance for your comments to my questions. I really do enjoy your website. Have a great day! have uou tried Marilyns recipe at Urbanhomemaker.com? i use the raw vinegar and it always turns out great. My family can’t taste it. Kelly, I’ve been trying the “Artisan Bread in 5 minutes a Day” but I like the all purpose bread that your recipe makes. Have you seen the Sue Gregg cookbooks? She has many recipes for “Blender breads” which are soaked overnight. Her waffles and breakfast breads are wonderful and she has a host of nourishing common sense recipes that I think would fit in well with your program. I just wanted to add that one of my favorite things about this recipe (besides the health benefits) is that I can split the work up into 2 sessions. With a 3 month old, I was really struggling to find a big enough block of time to make bread, but now that I can do the first chunk in the evening and then make the bread in the morning, I’ve been able to get it done much more easily! Thanks again for passing on the recipe. I just got the flour soaking for a 6 loaf batch. Hopefully this one turns out just as great! I made this today. DELISH! Megan, I’ve had major air bubble issues lately, thanks for the great tips! I just made the 3 loaf recipe today and it turned out great. I did tweak it a little though. I added 3 T Gluten and 1 T dough enhancer. I also only added 1 cup of white flour and then slowly added until the dough cleaned the sides of the bowl. That’s a sure way with the Bosch to get the right texture and not have to add more water. Also, a little tip so you don’t get air bubbles: Form the loaf (I just make the shape with my hands), then slam it down on the to counter. Reform and slam again. It will make a *splat* noise, but when all the air bubbles are out it will *thud. * I usually make sure it thuds at least twice and then just pop it in the pan. Thanks so much for this recipe! I plan on experimenting more and will let you know how it works! 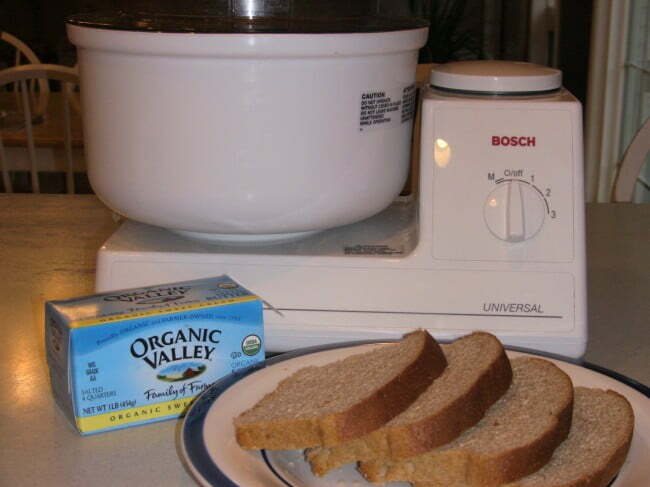 Try cutting the above recipe for 3 loaves and using 1/3 in your bread machine. I haven’t done this, but it should come out OK. After the first step, leave it overnight in your bread machine on the counter, and in the morning finish making the loaf right in there. I always used to take the dough out of the bread machine to shape it myself for the bread pan, and then let it rise and then bake. I use half hard red and half soft white wheat. The place where I get it sells ground soft white wheat as more of a pastry flour, so now I just get a bag of each and grind it myself. I also use gluten, org. potato flour and a bit of rolled oats to my loaves. 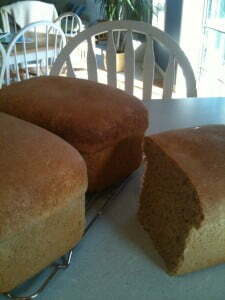 I have found that the potato flour helps tremendously to keep the loaves from being crumbly. I’ve been wanting to make a soaked grain bread. This is perfect! I can’t wait to try it! Kelly, thanks for your thoughts! Now I get it! If I ever get into breadmaking, I might have to make a compromise loaf myself because of the husband’s preferences. Yes, it’s good to avoid refined carbs, but if my family won’t eat it because it’s too heavy or hasn’t risen enough to make a lighter loaf, that’s not helping me much, so I add a little of the Bob’s flour to make it a bit lighter, and so it rises. You can’t “mill white flour” because white flour is made by processing a grain of wheat into separate parts. Anything you mill yourself is a whole grain, which is good, but as I said, it tends to make a heavier loaf that doesn’t rise as well, so I’m still doing a “compromise” loaf. I’m going to play with sourdough more again soon, and hope I can get more whole grains into that. I don’t think that has happened to me, hopefully it turns out OK – I’m learning that bread is so touchy! I have noticed that since I have started soaking my flour the night before that my dough (when I am done kneading it) comes out very stretchy. Makes me think of taffy. I have never had dough be that way. Have you experienced this? Thanks for bread recipe….trying it out this morning. Remember, hers isn’t a soaked recipe, though, but she has good luck with it. Kelly, do you have Shauna’s original recipe? I’m interested in seeing it if it’s completely whole grain. Thanks! To tell you the truth, I’m learning that bread is a STRANGE beast. I had great luck with this recipe for a long time, now recently it’s not been turning out as well! I’ve got to figure out what I’m doing differently! To answer your question, though, I’d try letting it rise more…but don’t hate me if it falls! I have made this recipe twice now. My second batch is in the oven and making our house smell yummy as we speak! But, both times my bread has looked like “flat-top” bread. It tastes great, and isn’t brick like, but is very flat on top. It doesn’t look like your pictures! Is this normal for this type of bread? Or do I need to let it rise more? I’m afraid to let it rise more for fear of it falling. I’ve been rising it on the stove top with the oven set to about 200 degrees to give it a warm cozy place to rise. And, both times it has soaked overnight for probably close to 18 hours. Now, I’m not sure about the size of my pans. I think they may be the “wider” loaf pans not the skinnier loaf pans. Hi Mary, I’m glad you liked it! I made your recipe using my kitchen aid. It was GREAT! I made 2 loaves & made 12 rolls which I flash froze & then vacuum sealed for another time. I haven’t made homemade bread in maybe 2 yrs. so this was a reall treat with our real butter! No, I haven’t gotten there yet, but I’ll try to experiment with this more soon. I also want to get the 6-loaf batch nailed down. Great Recipe. I made it yesterday and my daughter (the picky one in the family) loved it. Anyways, I wanted to know if you have adapted this recipe at all so that you don’t have to use additional “Bob’s Red Mill white unbleached flour”? I grind my own grain, so I would like to use all home ground grains rather than store bought. If I use 3 cups of whole wheat flour in place of Bob’s white unbleached, then the whole wheat isn’t soaked, which is what I am trying to get away from also. Any suggestion? Jennifer, I’m so glad it turned out well for you! I’m still playing with the recipe and tweaking things all the time. I always think there must be an “even better” loaf to be made! Thank you so much for commenting, Jennifer. I have a 6 qt KitchenAid and was wondering about that. I was thinking that everything seemed to jive with my past experiences with the KitchenAid but was thinking maybe kick it up to 2 or 3 on the speed for the kneading. I’m going to try this one day this week for sure. Where did you get your bread thermometer? I bought one but it can’t stay in the oven like yours! I got my thermometer from King Arthur Flour. Love it. I think the Kitchen Aid is similar, depending on the model and motor, but I don’t know for sure how it would compare time-wise to a Bosch. You couldn’t get as much dough in the K.A. though, so don’t overfill! As far as how long to let it rise, I just let it go until the bread is the height I want it to be at (judging from what would fit in my toaster! ), then bake it. I’m new to making bread, at least the RIGHT way. I currently have a KitchenAid stand mixer and want to try making bread a few times before we purchase a BOSCH. How would that affect the time necessary to mix and rise? I’m guessing I can’t apply the 14 minute mix on low to my mixer. Maybe bump up the speed? And how do I know when it’s done rising? When it has doubled in bulk? Kelly, I ended up leaving my dough to soak for about 18 hours and it was soooo yummy! Stuff kept coming up and I just couldn’t get to it before then. My family couldn’t get enough. They ate the 3 loaves in about a day and a half. Thanks! GREAT TIMING! I just had some not-done-enough loaves come out yesterday. The thermometer is on my list. How long can you leave bread dough in the freezer? Sorry, I have no specific length of time to give you, but I’d say no more than 6 months before it might get a freezer taste – and this is only if you have it sealed up nice and tight. That’s just a guess, though, sorry! Does anyone know how long can you leave the bread dough in the freezer? This is a great recipe. I have been making bread in my Bosch for many years, and this soaked bread is so much better than the usual homemade whole wheat bread. Much softer and fluffier. And BTW – I think using part white flour is the way to go!! But now I would just like to give you all the best tip ever for bread making (!) – use a digital roasting thermometer to have the PERFECTLY cooked bread EVERY time. After my bread has been in the oven for 15-20 minutes (waiting until most of the rising is done keeps it from rising up on the probe), I put the probe into one of the loaves, having pre-set the thermometer to alert me at 190 degrees. Then, when the bread is done the timer rings and out of the oven it comes. I haven’t had a dry loaf or a soggy center a single time since using this technique that I heard on a phone seminar with Sue Gregg. REALLY! You all should try this!! The thermometer cost me around $20, but it is soooo worth it! I JUST the other day made my first loaves with ascorbic acid, and wow, what extra wonderful loaves they made!! Thanks for your tips, neat that people buy your bread! I’ll be sure to ask you more if I’m struggling with my recipe! Thanks for all the info. I am baking bread with my Bosch and selling it to people. I think this soaking idea may help some of my customers who have said that they have a hard time digesting bread. I use 100 percent whole wheat. I use half hard red wheat and half hard white. I also add vitamin C and a little lethicin (I think thats spelled wrong. My loaves come out beautiful and light and never a brick. The vitamin C is the big trick! It’s often called ascorbic acid. Try 1/4 teaspoon per loaf. I also mix all the wet ingredients, and about 6 c of the wheat, and the yeast and lethicin and let it sit for 20 minutes or so and rise and get bubbly. Then I add the rest of the flour and the salt. Your bread will really improve with this step added in. Do you also mill your own spelt? I did mine with a glass bread pan (borrowed from a neighbor) before I got more, and it was fine baking it the same amount of time. Just look at it and if it’s not a nice golden brown, leave it a bit longer. Bummer about your rolls falling! All I can think of is maybe you let them rise too long, or were they bumped on the way out or back in??? I’ve had my bread fall a bit in the middle if I let it rise too long, very disappointing! I only have a glass bread pan – should I cook longer? Also I made rolls with “2 loaves” of the dough and they looked great after 3 hrs rising, but when I took them out of the oven to preheat it they fell into one big flat sheet of bread and never recovered. Tips for next time? Can I use a hand mixer to make this or will the bread not turn out? I’ve heard you should always soak on the counter, because in a cold frig, the phytic acid won’t be broken down. NT says at least 7 hours, but that longer is even better. I’ll change my recipe to say that. Thanks for the reminder. Thanks, Kelly. I am going to try your recipe. I put all the dough ingredients together the night before and soak it overnight in the refrigerator (18 hours ideally from what I have read). I am wondering if the 7 hours is long enough to break down the phytic acid. It would be great to not refrigerate it and have to wait for it to warm back up. I also never considered freezing the dough – what a great idea. I pre-slice my bread and freeze the extra loaves and that has worked out well so far, but I might try your method too. I use butter rather than coconut oil, but wow that could lend a great flavor. I am curious why you add the unbleached white flour? I grind a mixture of white and red winter wheats or for a really, really light bread white winter and kamut. Thank God you are on the ball this morning – geesh, you’d never know that I’m always working on my blog when it’s LATE and I’m super tired would ya? !